Unlike previous releases TDE R14.0.0 has been in development for over two years. This extended development period has allowed us to create a better, more stable and more feature-rich product than previous TDE releases. R14 is brimming with new features, such as a new hardware manager based on udev (HAL is no longer required), full network-manager 0.9 support, a brand new compositor (compton), built-in threading support, and much more! Also new in this release is a change from the KDE v3.5.x series versioning. In line with our new, separate identity, and to avoid incorrect comparisons with KDE SC based on version number alone, we are dropping the old versioning scheme and replacing it with our new R-series versioning scheme. Each new release from this point forward will be identified with three numbers prefixed with an R (standing for "Release"); the first number is the major series, the second is the minor series, and the last is the Stable Release Update (SRU) identifier. A stable series will be indicated by a single Rxx.yy identifier, e.g. R14.0. Major overhauls of the codebase that significantly and permanently change the way TDE functions, such as the transition from HAL to the TDE Hardware Library or the new style engine, will only occur when the major series number increments. Normal, incremental development, including new features, will be indicated with an increment of the minor version number. Bug fixes backported to a stable series (Rxx.yy)--with no new features or changed functionality--will be indicated by an increment of the SRU identifier alone. Installation instructions and binary packages are immediately available for Debian and Ubuntu. Packages for RedHat/CentOs, Fedora, Mageia, OpenSUSE, and PCLinuxOS are being built by their respective maintainers and will be made available at a later date. Live CDs with TDE R14.0.0 preinstalled are available on the LiveCDs page. The following is a list of the major improvements TDE R14.0.0 includes. New HAL-independent hardware support based on udev. HAL support is still available for those systems (such as *bsd) that require it. Significant renaming of applications, libraries, and packages to avoid conflicts with other desktop environments (most notably KDE). This allows TDE to be installed in parallel with other desktop environments without significant negative interaction. Upgrades to TQt3 (TDE's fork of Qt 3.3.8). TQt3 upgrades include a new, modern style engine, multi-threading support, and improved speed and stability. Support for network-manager 0.9 and newer. Switched compositor from Kompmgr to Compton-TDE, a fork of Compton with TDE-specific features. Added builds for armel/armhf architectures on Debian and armhf on Raspbian Wheezy. File mimetype detection system now based on libmagic. This is a non-comprehensive list of other significant changes made in R14.0.0. Significant branding overhaul and restyling. Continued migration from autotools to cmake. TDE integration support for LibreOffice available and maintained in upstream GIT. Improved Secure Attention Key support. Added optional Mac-like window switching. Kate sort plugin now available. Tasks are now manually rearrangeable in the taskbar. Added Show Icons Only option for taskbar. Improved application crash report framework, now also including source code commit references for better debugging. A mouse double-click speed test option in the control panel. A smooth crossfade effect is now available when changing the desktop wallpaper. Improved project documentation and localization. For a more detailed list of improvements please refer to the TDE R14.0.0 Release Notes (available here or by typing help:/khelpcenter/releasenotes in Konqueror or khelpcenter help:/khelpcenter/releasenotes from the CLI). The following applications have been added in this TDE release. The Trinity Desktop Environment (TDE) was forked by Timothy Pearson in 2008 from the last official release of the K Desktop Environment's third series (KDE3), version 3.5.10. 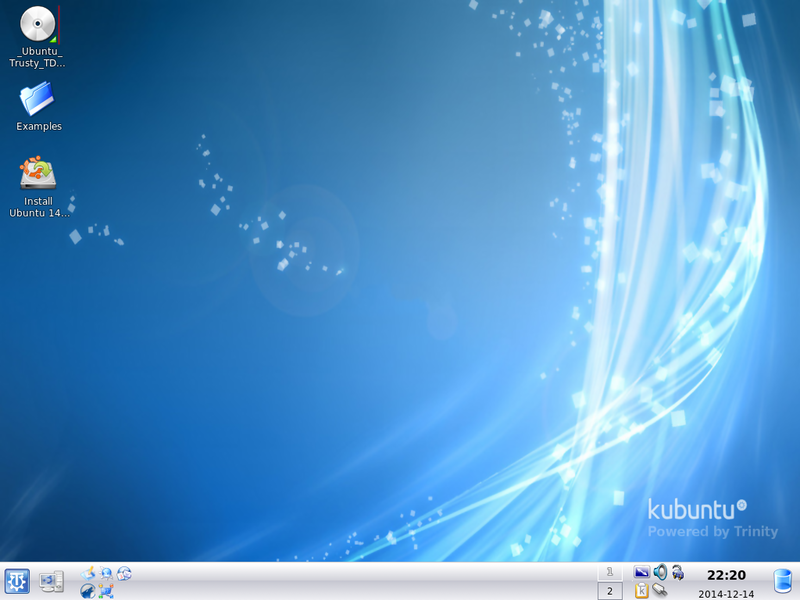 It existed as a set of modified KDE3 packages for Ubuntu until 2009, when it was merged onto a proper source control system (KDE SVN) and rebranded as TDE. 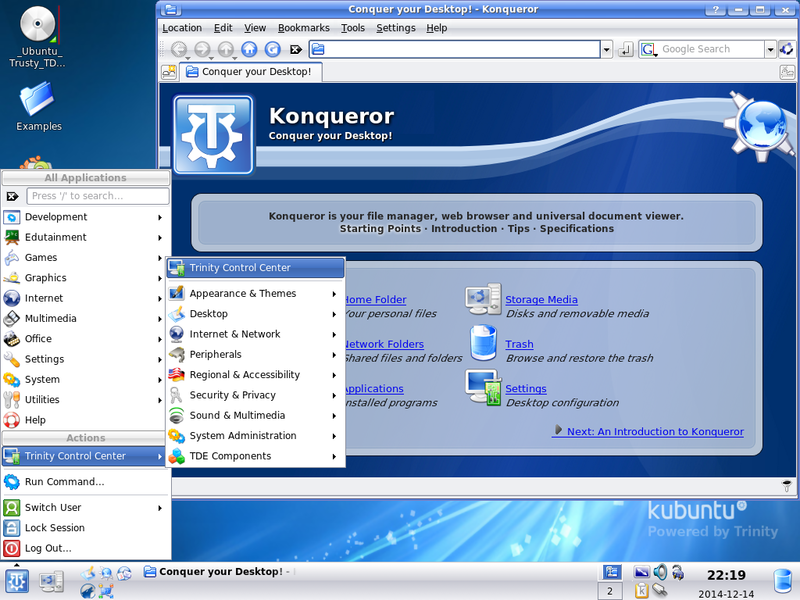 Shortly thereafter, TDE's core infrastructure was created utilizing spare computing capacity from Raptor Engineering; these infrastructure resources currently include the world's only Launchpad system based outside of Canonical Ltd. As the project grew, the TDE team migrated off of KDE's SVN server onto our own GIT server and has been completely independent from KDE from 2011 onward. From the beginning of the TDE project, individuals from around the world have contributed to TDE, and our original desire to provide a powerful, functional desktop environment in the traditional style has been upheld. The TDE project still is led by Timothy Pearson utilizing Raptor Engineering's computing resources. TDE currently is growing faster than it ever has before, with many new contributors--and our dependable core team of developers--helping to add new functionality, repair bugs, answer questions on the mailing lists, and increase TDE's overall quality. TDE fits into a niche similar to that of the MATE project for Gnome, but TDE is geared more toward those who want a productive, efficient interface with a high customization potential. Our dedicated team is continuing to refine TDE instead of rebuilding it from scratch; this prolonged development is something rarely seen in the open source applications arena. While our niche position may not be as glamorous as some of the larger projects such as KDE and Gnome we believe TDE is no less important to those who rely on it and use it in their daily work, and we hope that in the future our niche will continue to grow. Feedback from our users is an integral part of a large, user-experience oriented project such TDE. Whether you want to report a bug, suggest an improvement, or simply let us know your opinion of TDE, please feel free to contact us. Two good places to start communication are the project's mailing lists and bug tracker. This page was last modified on 16 December 2014, at 15:24. This page has been accessed 41,897 times.